"Easy-to-make chicken with a little variation. Great on the grill but just as good baked in the oven when you can't grill out." 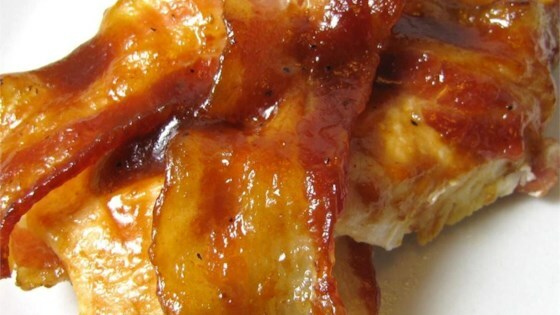 See how to make baked (or grilled) BBQ chicken wrapped in bacon. Used Sweet Baby Rays served it with mashed cauliflower and Brussels sprouts. I will be serving this meal again and again. Very easy and the meat is just perfect juicy with so much flavor. I like to use Sweet Baby Ray's barbecue sauce for this recipe. I serve it with mashed potatoes or buttered pasta as the boys like to have something on the side to sop up the sauce on the plate. I used Jack Daniels sauce and also topped the chicken with Cheddar and Monterey Jack cheese in the last few minutes so that it melted. Just like an entry we get a a local dinner. This was very good. I used Sweet Baby Ray's Chipotle BBQ sauce and it was awesome. My family and I really enjoyed it. I stuffed the chicken breast w fresh jalapeno, wrapped it in bacon, and smothered it in Famous Daves rich and sassy! *for spicy lovers!! baked about 45 mins. turned out awesome! I made this recipe tonight for the family. They all loved it! Added thighs to the mix. Also used KC Masterpiece sauce. A salad and Grand biscuits rounded out the menu.